Treadle Feeder for Poultry. 8kg Capacity. Home Treadle Feeder for Poultry. 8kg Capacity. 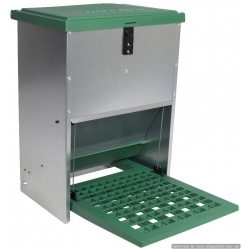 A Heavy Duty Rat proof outdoor poultry feeder made from durable galvanised steel holding 5 kg of feed. The chickens / birds stand on a Plastic treadle plate to lift a flap to gain access to the poultry food. Suitable for dry feed, poultry pellets & mash. It is an all-weather galvanised rat proof poultry feeder that cannot be operated by vermin. Galvanised, Vermin-Proof Treadle Feeder imported by Mac Eoin Ltd.. Suitable for all adult poultry, chickens & ducks. Treadle Feeder holding 8 kg of poultry pellets / mash for chickens, ducks, pheasants & all farm fowl. Treadle Feeder for Poultry. 12kg Capacity. Treadle Feeder for Poultry. 5kg Capacity.